Kuba and I are lucky to live in a city like Kraków. We have several options when it comes to buying dry goods without plastic so reducing our plastic waste is easy. Local shops and markets have bulk bins and even major supermarket chains have bulk bin sections. In a perfect world, all grocery stores would have bulk bins but unfortunately, this isn’t the case. If you’re inspired to reduce your plastic waste yet you don’t have access to bulk bins, don’t worry. You can still make a difference. Every little bit helps. Try eating more whole foods like fresh fruit, vegetables, and potatoes instead of packaged convenience foods. Plenty of fresh produce is available without plastic wrap. You might not be able to buy all of your produce without plastic, but if you make an effort to choose unwrapped produce, you’ll reduce your plastic waste and feel better in the process. Instead of snacking on packaged foods like crisps or sweets, reach for apples, bananas, clementines…whatever fruit is in season. While this might be easy for me to recommend because I’ve been vegan for 10 years and have followed a whole foods plant-based diet for a long time, I realise changing the way you eat sounds intimidating if you have no idea where to start. Thankfully, we have resources like Forks Over Knives. Their easy-to-follow recipes make starting a healthy plant-based diet easy. The FOK diet focuses on whole foods like fruit, vegetables, starchy vegetables like potatoes, grains, and legumes. It excludes meat, dairy products, eggs, and highly refined foods. Since whole foods are typically available without plastic packaging, you’ll end up reducing your waste and eat healthier in the process. It’s a win-win! 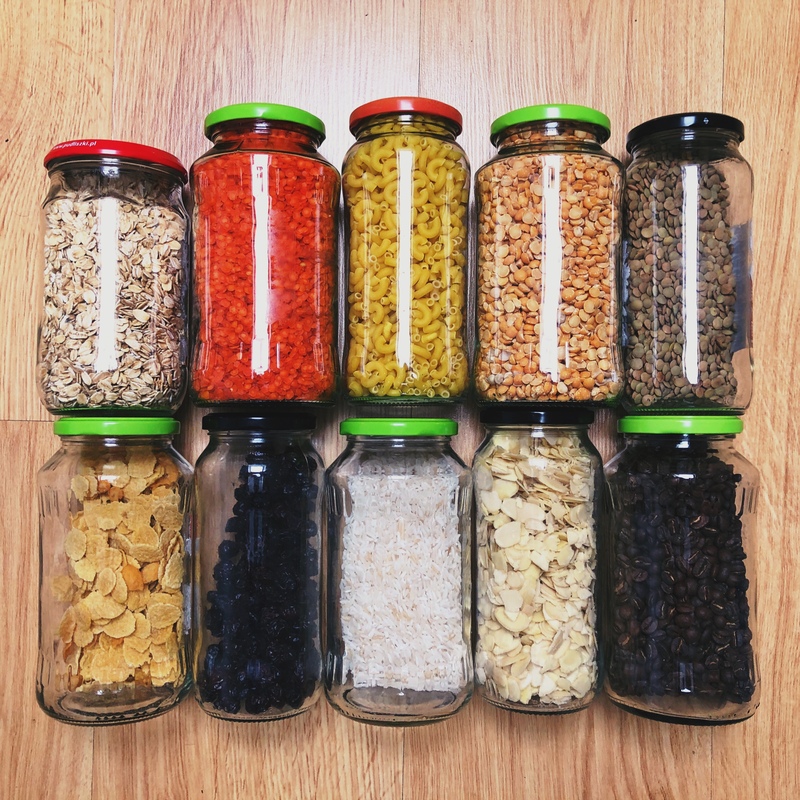 Bulk bins typically stock rice, grains, beans, nuts, cereal, dried fruit…the list goes on! If you don’t have bulk bins handy, a good alternative is to look for these items in paper packaging or boxes because this material is easily recyclable. Cans are recyclable as well. If given the option of cans or jars, I prefer to buy food in jars because I like to reuse the jars. If your only option is to buy the food you need in plastic packaging, buy the largest pack you can. For instance, if rice is one of your staples and you can’t find it in a paper bag, your next best option is to buy the largest sack of rice you can find. That way you end up with less plastic waste than if you purchased a bunch of smaller packs. In this situation, it really depends on how much I want oatmeal for breakfast. Let’s say I couldn’t find oats in a paper bag but I still wanted oatmeal for breakfast. If that’s the case, I should buy the kilo bag of oats. Sometimes the bags can be recycled. If not, I try to reuse them (sometimes to store rubbish or pack food to-go). To me, this is probably the easiest step we can take to reduce plastic waste. If you drink a lot of soda or juice in plastic bottles, try quitting it altogether or switch to glass bottles instead. I really like drinking sparkling mineral water but usually, it comes in plastic bottles. While these bottles are recyclable, I’d rather avoid them because I really don’t need to be drinking sparkling water in the first place. Tap water is just fine! If I really have a craving for sparkling mineral water, I can buy it in a glass bottle but for now, I’m happy to drink tap water with some freshly-squeezed lemon juice in my reusable water bottle. It’s cheaper and less wasteful. My last recommendation is to just think about your food purchases. If you can’t find the food you want without plastic, ask yourself if you really need it or consider substituting another plastic-free food in its place. The most important thing to remember is to do the best you can. If you can swap frozen veggies packaged in plastic for fresh ones, that’s great! If your only option for rice is rice sold in a plastic package, buy the largest bag of rice you can and don’t sweat it. Try and reduce your plastic waste in other areas instead. We’re fortunate to have access to bulk bins while living in an apartment. We’re reducing our plastic waste, shopping mindfully, trying new tasty recipes, and saving money in the process. I know it will be more difficult to find bulk bins once we move back into the van but I’m confident that we can make it work and keep our plastic waste low. That’s a good idea but it would mean buying an appliance for something that isn’t really necessary. To me, skipping the water is easier and less wasteful in the end. Thanks for reading! I wanted to make sure that you get my msg so I have decided to write to you there… In your last yt video, you said that you will not buy presure cooker. If you want to be really “Minimalist” then you ought to use it instead of other cookware(pan/pot)… it really helps saving fuel and your time cooking… It holds temperature longer, it is still cooking for several minutes after you stop heating it…, you only need small part of the water you would use otherwise(not for all things). Cleaning is fast and easy. It is trully marvelous thing. I can recomed one brand “hawkins” – only hard anodised “contura” line, as you can do everything with them(you need 5L at least), and it will lat for years. It is old technology so there is not a lot that could break, other manufacturers produce more suffisciated cookers, that hvae more issues.